This system is for those who do not require the advanced functionality of the MFP M40 imaging system. 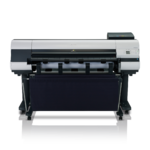 The new L-Series complements the current MFP M40 product line by providing a product that offers basic scan-to-copy capabilities at an affordable price. 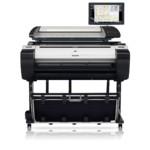 Offering more than just the scan-to-copy functionality, this imaging system gives you the ability to scan to USB, scan to your PC as well as reduce and enlarge images. With three different quality modes available, you can choose Draft, Standard or Best mode based on the scan/print you are creating. 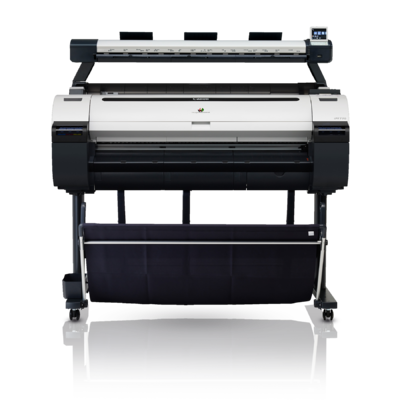 The iPF770 system comes available with user-friendly software solutions ready to meet your printing needs. Direct Print & Share, Canon's cloud portal solution1 and batch printing software, is available as a download and allows for files to be uploaded, downloaded, shared and printed from almost anywhere in the world! 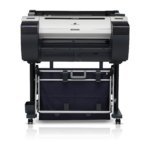 Also downloadable is a mobile printing app, imagePROGRAF Print Utility2, which allows for PDFs as well as JPEGs and PNGs to be printed through use of an Apple® iPad® 2. The Accounting Manager software (PC only) allows you to track job costs, while the Print Plug-in for Microsoft® Office enables for documents created with Word®, Excel® or PowerPoint® to be easily printed in large format. Creating custom signage has never been easier with Canon's included PosterArtist Lite poster creation software, this easy-to-use software will have you creating professional large format prints quickly in just four easy to follow steps. CANON and imagePROGRAF are registered trademarks of Canon Inc. in Canada and may also be registered trademarks or trademarks in other countries. 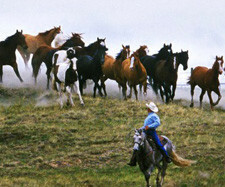 All referenced product names, and other marks, are trademarks of their respective owners. Not responsible for typographical errors. *Prices, specifications and availability are subject to change without notice. Actual prices are set by individual dealers and may vary. All printout images and effects are simulated. 1. Your server must be compatible with a webDAV enabled cloud account, including but not limited to, Google, Carbonite or Rackspace, to take advantage of the cloud functionality. Storage capacity and any pricing thereof is based on the third-party cloud provider's current offering, at its sole discretion. Your cloud account is subject to the third-party cloud provider's terms and conditions. Neither Canon Inc. nor Canon U.S.A., Inc. represents or warrants any third party product, service or feature referenced hereunder. 2. Available on AppStore℠. Compatible with iPad 2 or later, running iOS 6.1 or later. Data charges may apply. Printed output will be same size as original file. 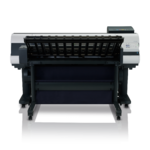 Mobile device and large format printer must utilize the same network. Printer must be connected to the same router that mobile device is connected to via wireless capability. Wireless performance may vary based on terrain and distance between the printer and wireless network clients. In order to print from imagePROGRAF Print Utility, user must open their PDF file in another, supported iPad app. Then, the user would select "Open in" and choose the print utility app. 5. For imagePROGRAF Printer Driver. For printing from PostScript applications such as Adobe Illustrator or QuarkXpress, please use a PostScript compatible RIP package. For a list of Canon recommended RIP packages, please consult with Canon Alliance and Industry Market list of RIP vendors. © 2015 Canon Canada Inc. All rights reserved.